In a new CBS News/New York Times poll, President Barack Obama’s disapproval level jumped five points, to 45 percent since the last survey in mid-January, with approval now at just 46 percent, but Thursday’s CBS Evening News skipped that bad news for Obama and instead highlighted some better news for the President. Obama’s approval vs disapproval – 46 v 45% in this new poll – stood at 50 v 40% as of January 18 and at 46 vs 41% in the survey released January 11, so while Obama’s approval level in the new poll matches the finding from early January, his disapproval is up from both January surveys and is now at its highest-ever level in the CBS News/New York Times polls. KATIE COURIC: In other news tonight, many Americans are suffering from a case of high anxiety. In a CBS News/New York Times poll just out, 70 percent say they are dissatisfied or just plain angry about the way things are going in Washington. 80 percent say Congress is more interested in serving special interests than the voters [13%], but the President gets better marks on that score. 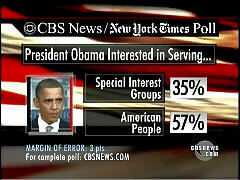 Most think his priority is serving the people [57 to 35%]. All in all, folks are feeling frustrated, confused and not particularly optimistic. Here's congressional correspondent Nancy Cordes. NANCY CORDES: CBS News and the New York Times polled one thousand Americans, blue collar and business owners, from Idaho to New York. We found deep pessimism about the economy and Washington's attempts to fix it. WOMAN: There's not a lot of good coming out of Washington right now. CORDES: Just 15 percent of those polled approve of the job Congress is doing. That's close to an all-time low. MAN: Right now, no, I don't really trust them. 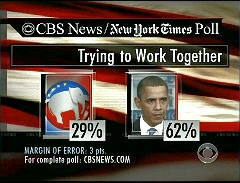 CORDES: And only 29 percent think the GOP is trying to work with the President, while 62 percent think Mr. Obama is reaching across the aisle. SECOND MAN: If Democrats and Republicans aren't going to find the middle of the road, then maybe we do need a third party. CORDES: His frustration helps explain why nearly 20 percent  of those surveyed now consider themselves members of the Tea Party movement. Who are they? According to the poll, 95 percent are white, they are just as likely as Americans overall to have college educations and to make over $50,000 a year. And like Kuna, Idaho, coffee shop owner Jared Hatch they are more likely to identify themselves as Republicans than independents or Democrats. JARED HATCH: This Tea Party movement is, I think, a great thing. It goes to show that the people aren't just going to stand for what the elected officials are going with. CORDES: But for more than half the country, the Tea Party movement remains a relative mystery. 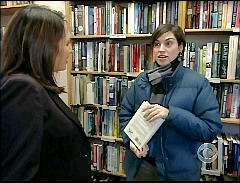 CORDES TO WOMAN IN BOOK STORE: How about you? I'm sorry, can you tell me what you know about the tea party. WOMAN: I know that it's a right-wing kind of conservative movement right now. 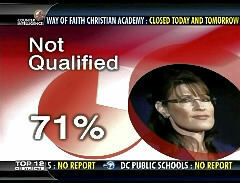 MAN: I know that Sarah Palin is associated with the Tea Party, but other than that. ANOTHER WOMAN: Um, from what I've seen, they look pretty angry. CORDES: Still, the Tea Party mentality is spreading. 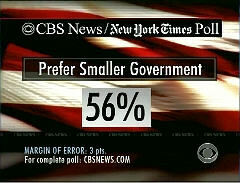 56 percent of everyone polled said they'd prefer a smaller government, providing fewer services. That's the highest percentage in more than a decade. MAN: I don't feel like it's the government's responsibility to bail out certain segments of the population. CORDES: In fact, concern about government spending is so great, that a majority of Americans -- 53 percent -- now believe the U.S. cannot afford to fix health care at this time. Katie. COURIC: Nancy Cordes, reporting, and ambushing people around the nation's capital.